Late in 2017, I started looking for another trail to walk prior to the Hamradio rally at Friedrichshafen in June 2018. Lindau is our radio club's favoured place to stay for the rally, so a long-distance trail in either Bavaria or Baden-Württemberg would be most convenient. I have already walked a few times in the Schwarzwald, which is a wonderful hiking area, so decided it was time to try a trail in Bavaria, preferably not too long or hard. 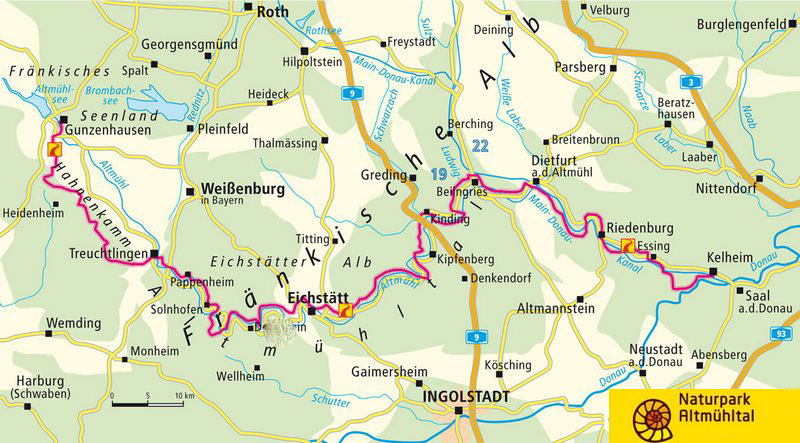 After some research on the Wanderbares Deutschland website, I had a shortlist of the König-Ludwig-Weg, LechErlebnisweg and Altmühltal-Panoramaweg. The first two options were deemed to be too easy with much walking on tarmac roads, so I chose the much longer Altmühltal Panoramaweg, which is classified as a "Qualitätsweg Wanderbares Deutschland". Opened in 2005, the 200Km Panoramaweg winds its way through the Altmühltal Nature Park, located between Munich and Nürnberg and generally follows the Altmühl river, the Main-Donau Canal and finally, the Danube. The Altmühltal is in the Bavarian Jura and became renowned for its fossils after the mid 19th century discovery of a fossilised Archaeopteryx in a limestone quarry near Solnhofen. From its start at Gunzenhausen, the trail follows along river meadows and juniper heaths, passing impressive rock formations of jurassic limestone and through beech forests to its end at Kelheim, near Regensburg. Similar to the Traumschleifen of the Saar-Hunsrück-Steig, the Panoramaweg also offers hiking loops off the main trail. To date, around 16 Schlaufenwege have been opened to provide interesting day hikes away from the main trail. In 2012, Wandermagazin voted the Altmühltal Panoramaweg to be "Deutschlands Schönster Wanderweg" and it is included as one of the "Top Trails of Germany". This status guarantees the trail will always be busy, but late May isn't a peak hiking time in Germany, so I was hoping the trail would not be too crowded and without hordes of inconsiderate mountain bikers. Some quite useful brochures and information can be downloaded from the Naturpark Altmühltal website. I also purchased the Hikeline Wanderführer and Publicpress Leporello Map, although these are not really necessary. Unusually for Publicpress, I found the map to be quite poor. Detailed maps and information can also be found on the Outdooractive website. As before, I downloaded the route information for my Outdooractive app. The downloads include large-scale detailed maps that can be used with a smartphone's GPS. I booked all of the accommodation in November 2017, using a combination of Booking.com where possible and direct bookings where necessary. These early bookings gave me rooms at very competitive prices (under €40 nightly) with options of free cancellations. All were close to the Panoramaweg. There are excellent transport connections along the Altmühltal, so I arranged to stay three nights in Treuchtlingen for walking the first two stages to Dollnstein. Coincidentally, most of the towns originally chosen for overnight stays have local breweries. As I needed to return home from Lindau, my plan was to fly from Heathrow to Munich and catch connecting trains. Whilst researching the Deutsche Bahn website for timetables and prices of the internal connections, I noticed that some interesting deals to/from London were on offer, so I toyed with the idea of going completely by train. However, the total cost couldn't compete with British Airways' �35 plus 8,000 Avios points, so I booked the reward flight as originally planned. The required connecting trains were also booked early (6 months before travel) to get the Sparpreis fares. Prior to buying the rail tickets, I purchased a Probe Bahncard 25 (valid for 3 months) which gave me a 25% discount on all DB rail tickets. The Bahncard paid for itself from the savings on ticket purchases. All my travel and accommodation requirements were completed before the end of 2017.